Dubrovnik, Croatia – Some 12,000 citizens from across the world – representing over 130 countries and territories – have signed a WWF petition urgently requesting the European Commission delegation at ICCAT in Croatia to support the scientifically recommended recovery plan needed to stop the imminent collapse of bluefin tuna stocks in the Mediterranean. Today in the Croatian city of Dubrovnik – where governments are meeting to discuss the future of bluefin tuna in the Mediterranean – the global conservation organization has presented the petition, on behalf of 12,000 concerned individuals, to the EU representative at ICCAT, Mr César Deben. 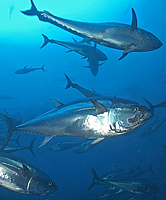 The role of the EU at ICCAT is critical in agreeing the strict recovery plan needed to save bluefin tuna in the Mediterranean. Yet the European delegation is still resisting the necessary measures. • Improved observation and reporting of all fishing and farming activities to curb illegal activity. “The EU is under even more pressure now to support the urgent and drastic meaures needed to save bluefin tuna in the Mediterranean – or it will be responsible for the collapse of this millennial fishery,” added Dr Tudela.